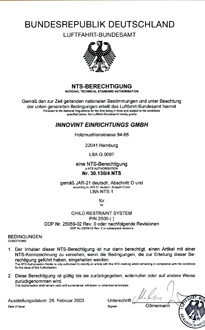 The SkyKids® child seat was approved by the German Aviation Authority on February 26, 2003 pursuant to LBA NTS 1. All requirements of the NTS 1 were fulfilled. The tests performed and supporting documents surpassed all minimum performance standards required by the German Aviation Authority. We thus set new standards for the qualification of child seats. Based on this, the Swiss Federal Office for Civil Aviation (FOCA) also announced the approval of the SkyKids® child seat on January 13, 2004. Airbus has specified the SkyKids® child seat and has added it to its “Cabin Configuration Guide” for its entire Airbus fleet as an option for its customers.